Created a new DOS disklabel with disk identifier 0x51707f21. Created a new partition 1 of type 'Linux' and of size 399 MiB. 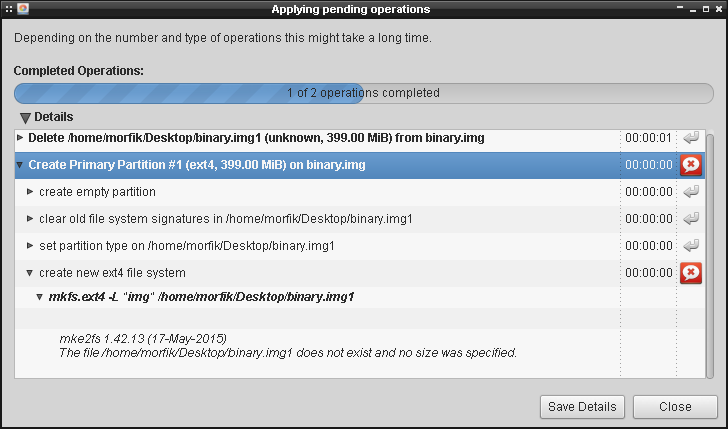 I don't know why it looks for binary.img1 , and I have no idea how to format the partition from command live. Does anyone know how to format it using ext4 filesystem? You can access the disk image and its individual partitions via the loopback feature. You have already discovered that some disk utilities will operate (reasonably) happily on disk images. However, mkfs is not one of them (but strangely mount is). The output /dev/loop0 is the name of the loop device that has been allocated. The --offset parameter is just the partition's offset (Start) multiplied by the sector size (512). Whereas --sizelimit is the size of the partition, and you can calculate it in the following way: End-Start+1, which is 819199-2048+1=817152 , and that number also has to be multiplied by the sector size. A device file encompassing the whole disc is named sda (or something else). This is what fdisk expects to make use of. Device files for individual slices of the disc, described by its partitioning, are named sda1, sda2, sda3, and so forth. 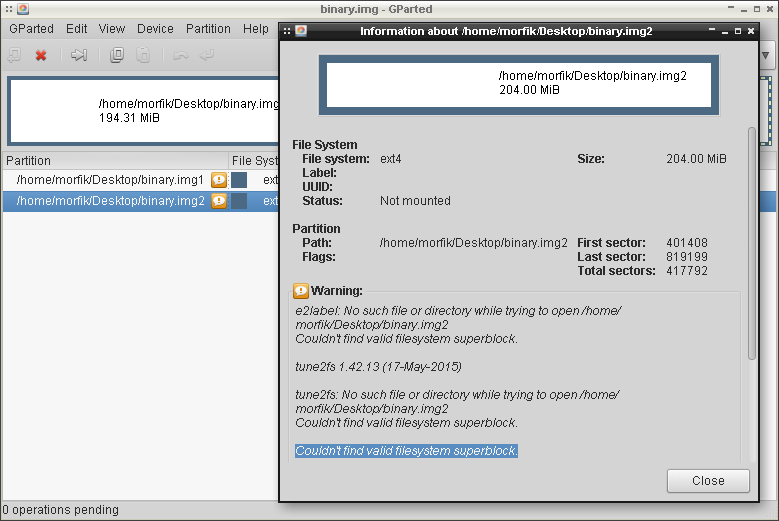 This is what tools such as gparted expect to make use of when they tell mkfs to do things on individual disc volumes. Of course, ordinary files don't overlap in the manner that disc devices files do. The discussions involving the loopback filesystem that you have seen are all about taking a single whole-disc image file and using loopback to create the 1, 2, 3, and so forth files that reflect the individual slices within it, once the desired partition layout has been written to the partition table. Though this topic is not directly related, it mentions a lot of the same and related information. If you cannot use apt to install some of the commands mentioned in this post, try using apt-cache search [package_name]. This may not turn up any results if the command comes from a package of a different name. For instance, losetup could formerly be installed as losetup using apt install losetup, but it is now part of util-linux in Ubuntu's repository. The way you find out what package acts as a container for another package, you must use the search for the online repository for you Linux distribution. Or, if you must install it from another source, use a Web search engine. Every Linux distribution also has its own online manpages. Sometimes it is easier to use the manpages than a tutorial. The manual pages will also tell you all the command options and parameters. A tutorial usually will only focus on the ones used. Not the answer you're looking for? Browse other questions tagged filesystems partition disk-image or ask your own question.